Abrasions are very common sports injuries that are usually caused by a fall on a hard surface. As the athlete falls or slides on the ground, friction causes layers of skin to rub off. The skin is composed of an outer layer (the epidermis) which provides protection, and a deep inner layer (the dermis), which provides the firmness and flexibility of the skin. Abrasions typically refer to an injury that removes these layers of skin. 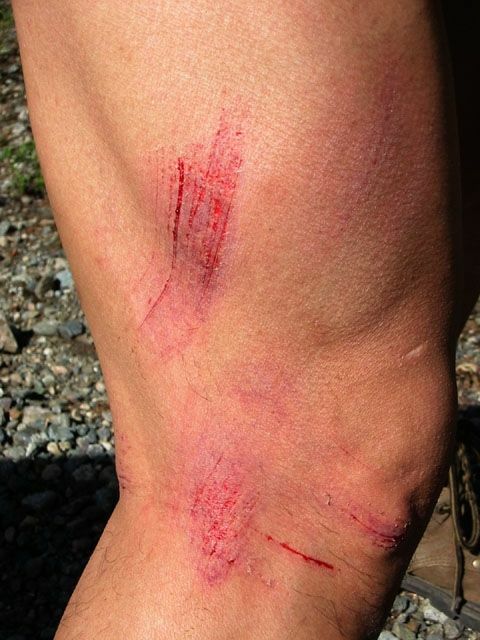 Cyclists often refer to abrasions from crashes as "road rash." While a bike crash has the potential to cause a painful and severe abrasion, most abrasions are shallow scrapes that do not extend into the dermis and don't cause a great deal of bleeding. While there is often little or no blood loss from an abrasion, there can be a great deal of pain because of the many nerve endings that are exposed. Conventional treatment of abrasions and road rash included treating the area by cleaning the wound with mild soap and water or a mild antiseptic wash like hydrogen peroxide, and then covering the area with an antibiotic ointment and a dry dressing. However, it has been found that the use of antiseptics such as hydrogen peroxide may actually cause harm to the tissue and interfere with the healing process. While a severe abrasion should be seen and cleaned by a physician, you can do some things to promote healing. First, because abrasions can easily become infected, you should clean the area thoroughly and remove any dirt and debris. Ideally, you want to irrigate the area with a nontoxic surfactant such as 0.9 sodium chloride or Shur-Clens with a bit of pressure (use a syringe if possible). The area must be completely clean. If necessary, use a clean gauze to gently scrub the area. Do not scrub vigorously, as this can cause more tissue damage. Use a semipermeable dressing (Tegaderm, Bioclusive or Second Skin, for instance) to cover the wound and attach the dressing to dry healthy skin with adhesive tape. The dressing should be changed every few days. Keep the wound moist until it has healed. A moist environment promotes healing, improves tissue formation and protects the area from infection. Your tetanus status is important to avoiding infection. If you are uncertain when you had your last tetanus shot or if your last booster was more than 10 years ago, you should get one. Tetanus is an acute infectious disease in which the voluntary muscles go into spasm. It is not only caused by stepping on a rusty nail; it can also develop in wounds in which the flesh is torn or burned. (See Adults Need Tetanus Shots, Too). While cleaning the skin abrasion, you should look for any deep cuts that may require stitches to heal properly. Cuts that continue to bleed after 15 minutes of direct pressure, or cuts that extend deep into the skin and have edges that pull apart, may require stitches. If you are unsure if you need stitches, you should see a physician immediately. After an abrasion, the layers of damaged skin will heal from the deeper layers to the surface layers and from the outer edges to the center. As healing begins, the area of the abrasion may look pink and raw, but in time the wound will form new skin that is pink and smooth. Prevention of abrasions is possible by wearing protective pads and covering any exposed skin with a layer of clothing. Generally, you can predict when you will suffer an abrasion. So it is wise to have the necessary first aid supplies available in the event of an emergency.